RICOH THETA housing TW-1 offers superior convenience. GoPro Fusion “bubble” housing brings superior optical quality, especially at the stitch line and in directional light (like the sun from one direction). Large size of the GoPro Fusion housing and software glitches makes it a hassle to use for diving. RICOH THETA workflow is smooth, but housing is clearly visible in images and video. Note that this site is sponsored by RICOH. The reviewer received no money for the evaluation. The reviewer is more familiar with the RICOH THETA. Some of the problems with the Fusion workflow and software may be resolved with more experience with the Fusion. In addition, please see the note under the Fusion review section for more information on prior experience with the THETA V on land and GoPro Hero 5 underwater. It’s difficult to compare the pictures as the THETA V and the GoPro Fusion were used at different sites and at different depths. Most of the THETA V shots were taken at 90’ and appear blue due to the ocean water filtering out the red color elements. This article was written based on interviews with the reviewer. Best stitching results were achieved when the light source was even and directly above the camera. The two sides appear similar if diffuse light reaches both lenses equally. Problem with lack of self-timer mode. Note that this problem of the photographer being in the picture has been resolved with the development of the scuba plug-in. Note: The reviewer is a student researcher that works as scientific diver. 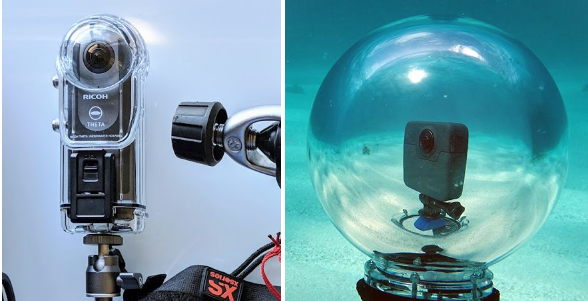 Although the reviewer only used the THETA V and the GoPro Fusion cases once, the reviewer had prior experience with using the THETA V on land and extensive experience using the GoPro Hero V on land and underwater. Some of the frustration with the GoPro Fusion may be reduced through continued use. The camera did not save .THM (thumbnail file) and .LRV (low resolution file) when taking a 360 video. But this is fine because I have the actual .MP4 file. Right??? I run some software to recover about half of the .THM/.LRV files. After stitching the video I realize that the camera’s “auto focus” settings have made it unusable. I decide to move onto the 360 pictures. I realize the 360 photos are not stitched inside the camera. I have a bunch of fisheye photos. I open up the Fusion application and try to import my raw fisheye photos for stitching. I receive the most inefficient/ridiculous process for stitching photos I have ever seen. (I attached a screenshot below). Luckily I have Lightroom (and know how to use it). I open up 40 360° photos, apply some quick edits and re-export to the folder. I rename each one individually according to GoPro’s naming conventions and attempt to re-import. I try to import two un-stitched photos. I go ahead and stitch my photos one at a time and export. The resulting photos look great. The photos are attached below. I believe the actual photo quality of the GoPro is superior to the Theta’s. However, the software and the camera as a whole is horrible. It overheats after about 30 minutes, and has a weird 2 SD card system (the front camera records to the one SD card while the back records to the other). The 2 SD system is made worse by the fact that stitching needs to be done on the computer and must follow strict organization/naming conventions. The final kick in the gut is that even after all that you run a 50% chance of getting your videos to actually work.